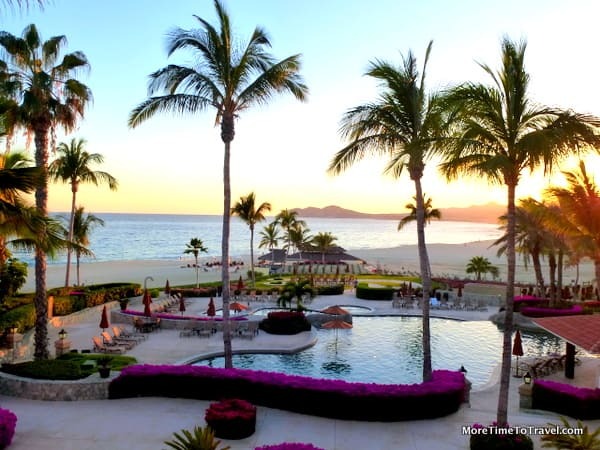 LOS CABOS, Mexico — Nonstop laughter resounded from the round table of nine seated in the corner of a fine-dining restaurant at an all-inclusive resort. To further pique my curiosity, each woman had a brightly colored silk flower pinned in her hair. I couldn’t resist approaching them to find out their story. “We call ourselves the Traveling Ladies,” one said. They were single, married and divorced; working and retired; and ranged in age from 40 to 60. They met while employed in different offices of the same federal agency in Washington, D.C.
Clearly, these women worked hard and played hard: This was their sixth-annual girlfriend getaway, this time to the Zoetry Casa del Mar resort at the southern tip of the Baja Peninsula. Each five-day, four-night trip had been scheduled for mid-February, taking advantage of the long President’s Day weekend and tacking on another day or two of vacation leave. Prior jaunts had taken the ladies to beach resorts in St. Lucia; Playa del Carmen, Mexico; the Dominican Republic; Curacao; and Turks and Caicos. “The bonding starts on the plane: meeting up at the airport, adjusting seats to sit together, having a mimosa or two and getting a head start on relaxing,” Uthe added. The group prefers all-inclusive resorts so they don’t have to labor over splitting meal bills or worry about who drinks and who doesn’t. The Traveling Ladies choose oceanfront properties in warm, sunny climates, preferably in locales most of them have never visited. Some book single rooms, and others double up to reduce costs. They book early to lock in favorable hotel and airline rates and to secure rooms next to each other. They boast about another cost benefit of traveling with girlfriends: They can haggle when shopping, usually very successfully, and get “group rates” for clothes and jewelry purchases. Though this was the most expensive trip they had taken, the boutique property with only 63 units meant not having to save beach chairs or fuss with dinner reservations. Plus, cooking lessons, tequila tasting, afternoon tea, access to the spa and wellness assessments gave them activities to bond over. Every evening the ladies met at dinner to share experiences and plan the next day. They lapsed into “shop talk” only occasionally. “People often comment on what fun we’re having,” said Amy Lakroune, of Arlington, Va.
For these ladies — and many girlfriends — being together is more important than the destination. Girlfriend getaways are a welcome escape from the stress of juggling careers, caregiving and other responsibilities, allowing women time to nurture their friendships. When they return home, the ladies share memories again by posting digital pictures on a photo-sharing website — and planning their next getaway. The Traveling Ladies paid about $2,400 per person for their four-night trip, including airfare. Update 9/16: The resort is no longer under the Zoetry brand. Should you take a villa vacation? Wow, this sounds like a blast! I need to get a bunch of friends together and start doing this. Wanna join me?? The sign-up list starts here, Sheryl! This may sound strange, but I worked in an all women lawyers law office. When we had to go out of town to a professional conference, that was sort of like our “girlfriends getaway”. We would meet up with and have dinner with other women from all over the country we had met over the years attending the same conferences and we usually had at least half a day to do something other than work. How’s that for wild and crazy? There’s a reason why our sons call me, “Mrs. Excitement”. It’s so nice to have colleagues at work that become your close friends! And to have a girlfriend’s getaway paid by your employer is the icing on the cake! How fun! Sheryl – I’m in! What a lovely story, Irene. I can’t think of a better tradition to start.